A pair of old custom built solid wood doors needing refinishing. 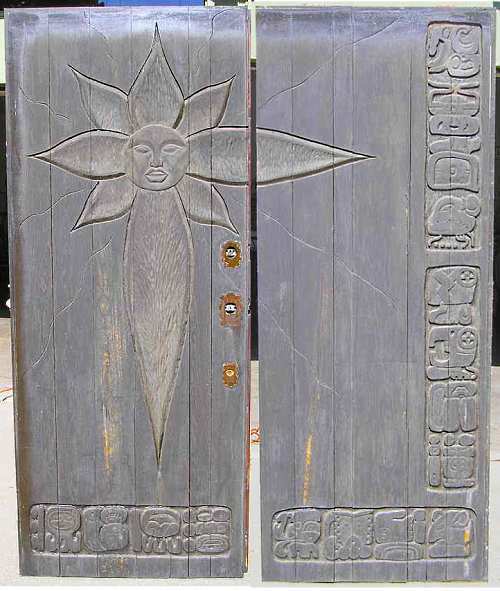 A custom wood door is defined by its uniqueness and these doors are certainly that. When I originally looked at these custom entry doors I envisioned a lot of work in order for a new finish to be applied. After talking with the homeowner, I came to an understanding that they needed a very good finish at the best possible price. The picture is a good representation of the overall condition of these custom entry doors. Many layers of different finishes had turned a grayish black color over time. The homeowner said they were beautiful 30 years ago. Unfortunately these custom entry doors have not been properly maintained since. A plan was needed. Refinishing any custom entry doors can be time consuming and expensive. The expense was a problem for the homeowner and the time was a problem for me. Aggressively sand off the finish. This needed to be as fast as possible. Stain each custom wood door to add color and hide a few imperfections. Apply a tough UV resistant finish to protect all of this hard work. For the Do-I-Yourself home owner, try to have a complete plan before starting. This includes the stripping process and the needed tools, color and type of stain plus the type of clear finish. Having all items on site will make this process more efficient. The author should have been more detailed about the finish. He is correct you need to use a finish that withstands the outside elements. My trade for 38 years has been exclusively refinishing and finishing front doors in Cincinnati Ohio. The only product I use is McCloskey’s Man-o-War Marine Varnish. You can simply sand the polyurethane, I apply a coat of pre-mixed orange shellack cut 50% with denatured Alcohol. This is a bonding coat. I apply gloss marine varnish over the shellack. If you have bad water damage bleach the door before you sand or prep. This bleaches only the area that has been exposed. You can run a light coat of stain over it to even it out. Apply 3-4 coats of marine varnish. It drys so fast you need to brush in one direction back brushing from dry to wet. Lift and back brush lift and back brush.Be certain to coat the top and bottom of the door to prevent water from soaking into the end grain. Good luck with you’re projects and give me some feedback. Remember work is fun!